What made you choose CrossFit True? The great personal reviews & proximity. What has been your proudest moment in the past 90 days? I hit a few double unders recently. Our 2 boys Jackson & baby Henry keep us nice & busy with any free time we have, that usually means living on a baseball diamond or a basketball court. When I get time, I’m either cooking, going for a run or sleeping. As clean as possible! However if there are any cake or cookies around, it’s all over, clean goes out the window. What are your 3 favorite movements/exercises? What music gets you pumped up? How have you changed physically and mentally since you started training at CrossFit True? Although I sit at a desk all day, I stand straighter & have better posture because things are getting stronger. I also have much more flexibility than I ever did! Mentally I have a much more positive outlook. How have you goals evolved since you started training with us? My initial goal was don’t get hurt! I was a pretty consistent runner too. I needed to create variety in my workouts. Now it’s how do I push myself closer to achieve a new PR or get closer to executing a movement with which I still struggle. 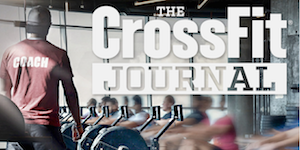 What has been the biggest surprise since joining CrossFit True? The addictiveness of success is incredible! It’s not just the personal successes but being able to celebrate the successes of others. It’s a great environment. What can you do now that you weren’t able to do before you started training with us? I don’t know if I can say anything that hasn’t already been said. The coaches are phenomenal in their knowledge & their ability to pivot to support you personally. The support of the other members helps motivation & your success. This place is awesome! !